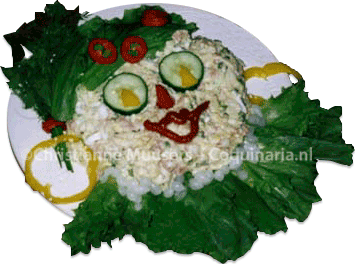 I suppose Russian Salad is a popular dish all over the world, but I wonder whether it is as connected with festive holidays as in the Netherlands, where it is called Hussar’s Salad (‘Huzarensalade’). 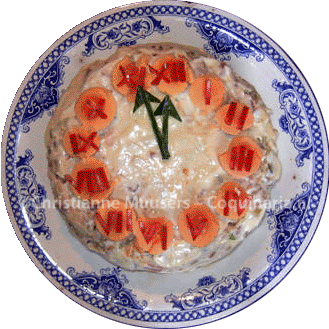 It is a traditional dish on New Year’s Eve, presented as a clock with the hands pointing at twelve o’clock. 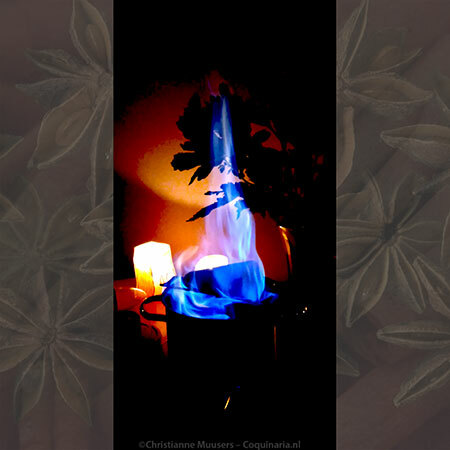 And in my family it is also a traditional dish at Saint Nicholas’ Eve (Sinterklaas, 5 December). Then the salad represents the bishop’s helper, ‘Piet’, who climbs up and down chimneys to see if the children have been good, and to deliver presents. Where I grew up, we had no hearth, just central heating. So we sang our songs near the convection radiator, secretely wondering how Piet was going to deliver the presents through those thin pipes. 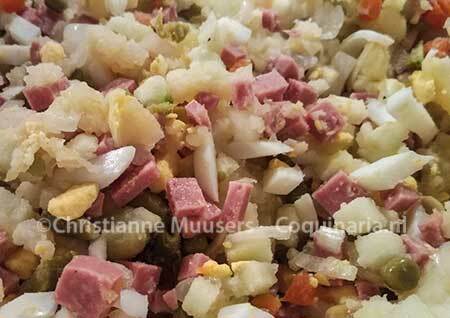 Elsewhere on this page is a picture of the potato salad decorated as ‘Pieten Salad’ for Sinterklaas. Another version of Russian Salad with Dutch herring can be found here. The recipe on this page dates from my youth, sixties and seventies of twentieth century. The ingredients reflect this: canned vegetables and meat. I still make it that way, out of nostalgia. This salad is easy to prepare in large quantities, exactly right for parties. It needs to be prepared at least a few hours in advance to improve the taste. That way you’ll have at least one dish that can be prepared the morning or even the day before the party. If you are curious about the historical Russian Salad, look at this Wikipedia article. It seems that originally the Russian Salad and Hussar’s Salad have different origins, but in ‘low cuisine’ there’s hardly any difference. 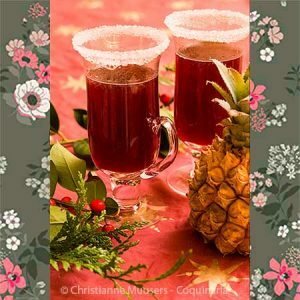 There is also a nineteenth-century recipe for Russian Salad on Coquinaria from Russia. Good Russian salad is very tasty, has to be prepared well in advance, and is a perfect center-dish for a cold buffet because it is filling. It is also a dish that can be easily decorated in several ways. The amounts in the recipe below are for a large buffet dish; preparation 30 minutes + decorating the salad. Salad – Peel and cook the potatoes, let them cool to a tepid temperature. While the potatoes are boiling, boil the eggs and prepare the other ingredients. Drain the can of Macedoine, the pickled onions and the pickled gherkins. Chop de onion very finely. Peel the eggs and chop them too. Cut apple, gherkins, smac and pickled onions into small cubes, and put into a large mixing bowl. Dice the potatoes too, and add them to the bowl. Dressing – I have not mentioned any amounts for the ingredients of the dressing. Someone once asked me why. The amounts were left outbecause they depend on too many variables, like the ingredients of salad: the aplle can be more or less tart, the pickles can be more or less sweet. Ketchup and mustard also vary in taste depending on which brand and variety is used. I could give the perfect amounts for my salad dressing, but that does not mean it is perfect for someone else. And even my dressing changes from time to time. Mixing salad and dressing – I prefer not to mix all ingredients for the dressing seperately and then adding the dressing to the salad, byt to add the ingredients straight to the solid ingredients. Begin with adding mayonnaise. Then, at least, that is how I proceed, add a little bit of one ingredient, then of another ingredient, and so on until the salad is to your taste. Because YOU are the cook, and should be able to depend on your own taste and experience. I personally like my salad slightly on the tart side, so I will probably add more vinegar than most people. But try to refrain from adding sugar. Ready-bought salads (and other foodstuff) are often sweetened with sugar or chemical equivalents. Because these are enhancers of taste, without needing to add more real ingredients. Mixing salad and dressing should be done at least a couple of hours before serving, it can even be done the day before. Taste the salad before decorating it, to see if it needs more salt or pepper, or extra mayonnaise, ketchup or vinegar. Take the salad out of the refrigerator at least half an hour before serving. Ice-cold salad has little taste. The easiest way to serve the salad is to just scoop it in a bowl without extra garnish. In the beginning of the twentieth century the salad was often served on scallop shells as hors d’oeuvre. The salad can be eaten on toast or crackers, or straight from a plate. I prefer to eat it without added carbohydrates, because the salad is rich enough already. Leftovers keep for several days in the refrigerator. Whatever decoration is chosen, the first thing to do is shaping the salad. I use a springform to make a round salad with a flat top. Arrange the salad on a dish, on top of some lettuce if you wish (rather clichéd, although I used it to make a ruff for the Pieten Salad). Now cover the salad with a thin layer of mayonnaise, using a palette knife, to get a more or less smooth surface. You can mix the mayonnaise with ketchup for a little colour, or even use food colouring. However, people do not like to eat savoury food with unnatural colours (sweets are another matter entirely), chances are you’ll be left with a lot of salad. To decorate the salad as a Pietensalade for Sinterklaas, use a large round flat dish. Put a layer of curly lettuce or endives on the rim for one third of of the circle, arrange the salad in the center. The green leaves are now a frilly ruff. Cover the salad with a thin layer of mayonnaise, as described above, to make the ‘face’ on. The eyes are slices of hard boiled egg or cucumber with slices of gherkin or a dollop of ketchup as irises. The nose is the end of a cucumber or carrot. The lips are drawn with tomato ketchup. Cocktail onions can be used to decorate the ‘ruff’ with ‘pearls’. Use two rings of yellow bell pepper as earrings, and make a cap from more endive leaves, or cucumber slices, decorated with halved cherry tomatoes. Piet also has a feather on its cap, this can be made with dill. To make a New Year’s Eve Salad like on the picture at the top of this page, is very simple. The two hands are cut from strips of cucumber or bell pepper, the hours are put on twelve halved egg yolks. It is easiest to use Roman ciphers (I, II, III, IV, V, VI, VII, VIII, IX, X, XI, XII), unless of course you have a small cookie cutter for ciphers. Very symbolic is making two dishes: one Russian Salad made up as an old man representing the old year, and a sweet cake covered in pink marzipan decorated as a baby face to represent the new year (to be eaten with champagne). Important: whatever decorations you use, they have to be edible and harmonize with the taste of the salad. The name is French, but it refers to Macedonia (ancient Greece). Originally that was a mass of small kingdoms that were finally united under Phillipos II and his son Alexander the Great in the fourth century bC. Since late in the eighteenth century one used the name macédoine for a cold mixed dish of fruit (in sugar syrup) or of boiled vegetables, the small pieces of diverse fruit or vegetables representing the manifold kingdomes of ancient Macedonia. Nowadays you can buy macédoine of fruit and of vegetables in supermarkets, canned or in glass jars. But you can’s just pick any can of ‘mixed vegetables’. Officially, Macédoine must contain at least four different vegetables (peas, carrots, turnips, potatoes, stringless beans, celery, white beans). So there is no sweet corn or kidney bean in Macédoine. According to my Larousse, the vegetables are to be diced in 4×4 mm cubes exactly.